wanderlust ATLANTA: Oh, What a Knight! "Be swept away to an age of bravery and honor and witness epic battles of steel and steed. From ringside seats, discover a feast of the eyes and appetite with all the splendor and romance of 11th Century Spain." 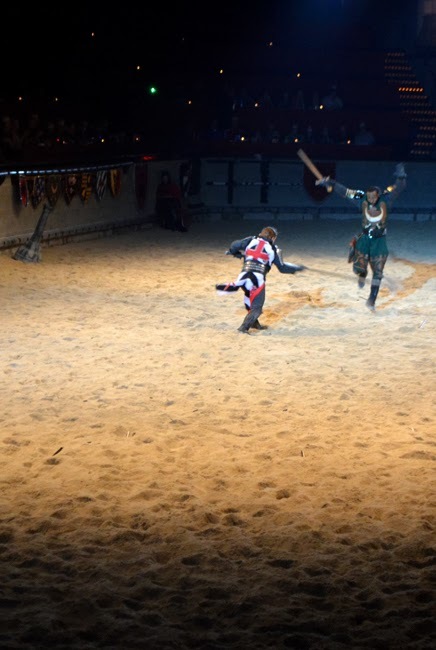 Medieval Times Dinner & Tournament delivers on its promises! 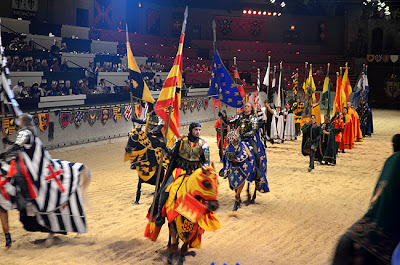 I'd wanted to go to Medieval Times for years—my list of things to see and do is surprisingly long, even after blogging for more than three years. 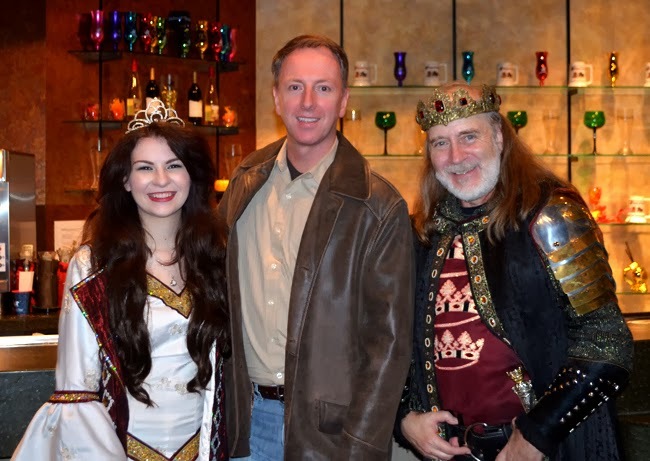 Recently, I was graciously invited to Medieval Times as a guest and I brought three lady friends along with me. One had been a number of years ago and the other two had never been before. We all were excited and not quite sure what to expect. The greatest majority of my Medieval experience has been in cinema. Unless you count the Renaissance Festival I went to in Washington, DC a number of years ago (with a great friend who had 15 years worth of costuming—yes, I wore tights and a funny hat! LOL). I know, I know...those are separated by centuries, but they both evoke grand fun! As we were approaching Medieval Times, I became downright giddy, which my lady friends found amusing—although, truth be told, I think their laughing at me was a cover up for their own excitement. They'd been talking about it all day long and in the end, they too had a wonderful evening—I think especially during the photo ops with the Knight's after the show. So..."dinner" and z "tournament". I wasn't expecting too much. This is a tourist attraction and as much as I love being a tourist, some have the reputation of being tourist traps. I wasn't sure what to expect here, but having met the beautiful and charming Alyson, with Medieval Times, I was hopeful and excited about visiting. Wow! When they say "dinner", they mean an extremely filling dinner—four courses of great food! And how much fun that—just like in 11th Century Spain—you have to eat with your hands! How often do you get to do that in public? Our server, Wench Kristy, was funny, attentive, brilliant and an absolute delight. The servers' performances are amazing in themselves. I promise you, this is a dining experience unlike any you've enjoyed before...I can hardly wait to go back! By the way, don't feel like you have to eat every morsel that's served...they'll offer a box so you can take home leftovers. I didn't need a box. I'd read that the show—the Tournament—was two hours in duration. I didn't know if that was from the point we walked in or from the main lobby or from the King & Queen (or was she the Princess?) announcing the start of the Tournament. Oh my goodness, thinking that we were approaching two hours into the Tournament, I looked at my phone to see what time it was, just because I felt like I'd lost track of time. We were only an hour into the show...there was so much more to come! 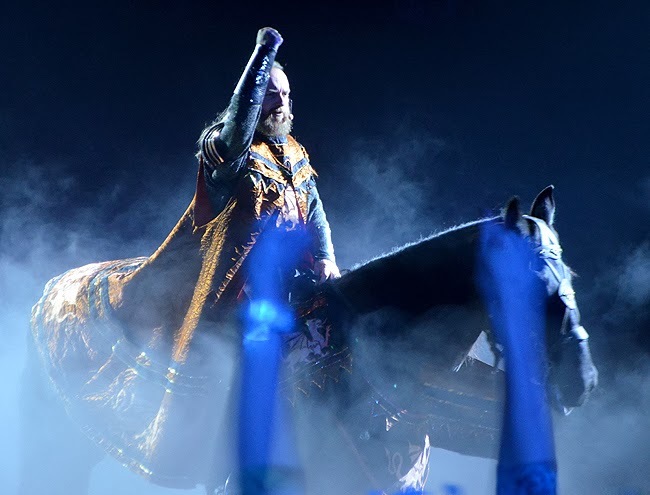 There's a lot to take in—and I mean a LOT—and I won't give it all away here, but know that you'll see heart-pounding jousting, sword fights, spectacular horsemanship, gallantry, fantastic costuming, super-cool lighting and smoke effects, and music with an rock influence that's been specifically choreographed for this show. 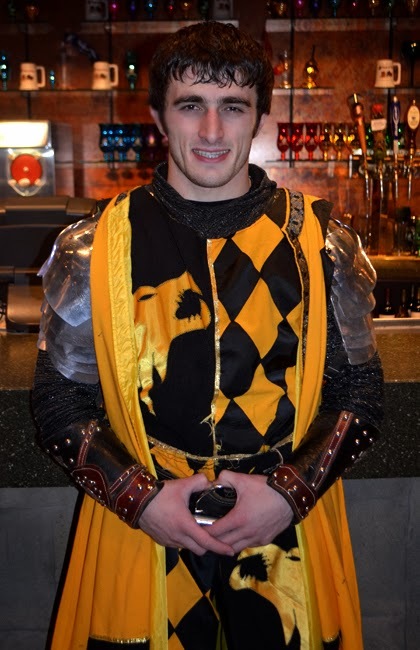 When you arrive, you're aligned with a particular Knight. 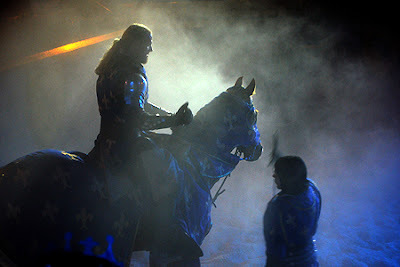 Our credentials indicated we were allies and fans of the Blue Knight. Again...Wow! The Blue Knight won the tournament!!! And he went through a LOT to win said Tournament...seriously, there's ceremony and competitions galore! In my book, they all won, because everyone in the audience was having a blast! The "main lobby", which I'm assuming they call the Great Hall, is where we started and where we finished. The lobby is HUGE! They have one of the largest fireplaces I've ever seen. I think the only fireplace even approaching this one—that I've seen—is at the Biltmore Estate in Ashville, North Carolina. There's also a bar that's open before and after the Tournament, seating tables, a gift shop, there's a photo-op with the King & Queen on your way in, and about a bazillion suits of armor...there's actually a lot going on even before you get to the Tournament! 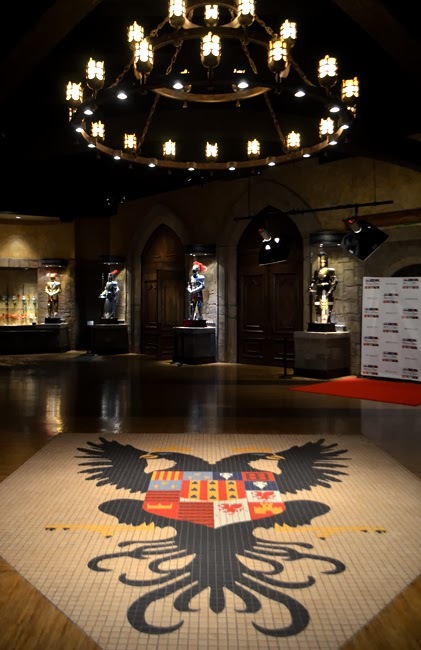 Immediately following the Tournament, the King, Queen, and the Knights are in the main lobby (seriously, it must be called the "Grand Hall"...I feel silly calling it a lobby), for photo ops. And every single one of them are charming, friendly, gallant, and quite happy to pose for photos with guests. We made quite a few, many of which you can see on the wanderlust ATLANTA Facebook Page. I've loved suits of armor since I was a kid...a young kid. And some things last a lifetime, including my love of armor. Actually, friends I've mentioned on the blog before have an incredibly handsome, historic suit of armor that overlooks the Atlanta skyline. 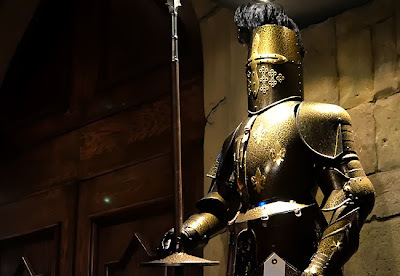 I've not been around this much armor since visiting the Met in New York City! 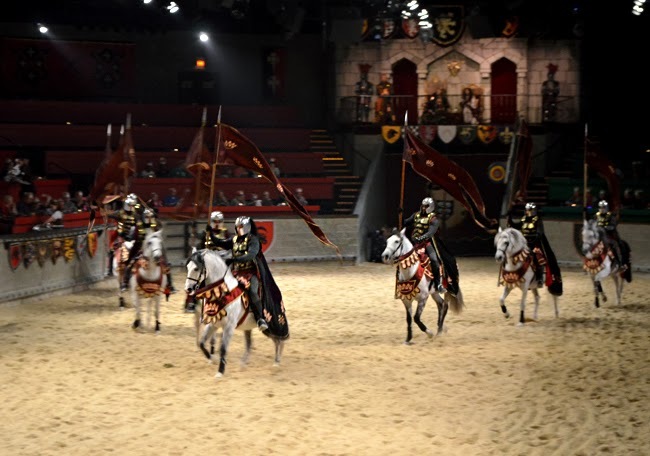 Your ticket to Medieval Times includes the four-course meal and the two-hour Tournament. Cocktails are available for purchase and please remember to tip your servers (gratuity is not included in the ticket price). This family-friendly attraction is also a popular special occasion destination. There were guests who were celebrating anniversaries and birthdays ranging from seven to 53 (the range could be wider, but those are the ones I remember). 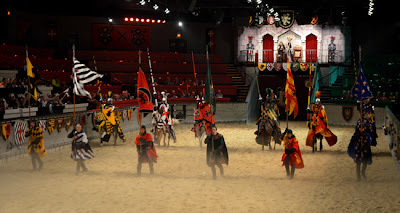 And I can say with certainty that they had a wonderful time celebrating with the Knights, squires, wenches, and the Princess, as did I and my friends.